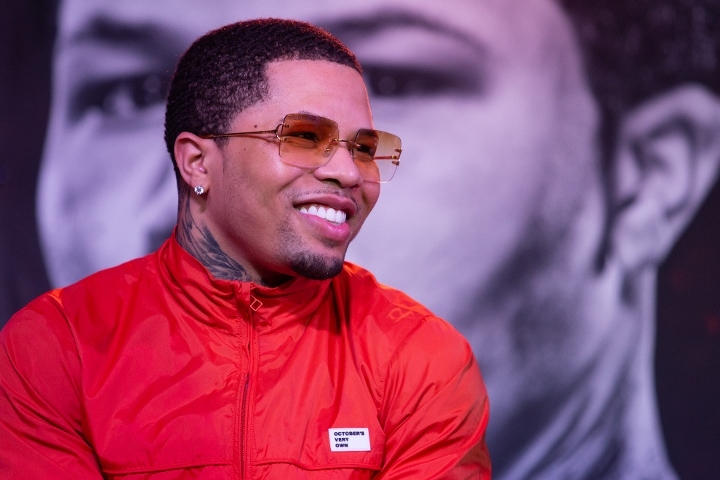 Gervonta Davis has heard and read a lot of criticism about boxing a featherweight since Hugo Ruiz replaced Abner Mares as his opponent last week. Ruiz will move up four pounds, from 126 to 130, to challenge Davis for the unbeaten Baltimore southpaw’s WBA “super” world super featherweight title Saturday night in Carson, California. Mexico’s Ruiz fought at featherweight just 2½ weeks ago, but at 5-feet-9½, Ruiz stands four full inches taller than Davis, who would’ve owned a one-inch height edge against Mares. Now that he’s suddenly facing a significant height disadvantage, the 24-year-old Davis can’t understand why he is being criticized for fighting someone coming up only slightly in weight. Mares also would’ve moved up from 126 pounds to 130 to challenge Davis (20-0, 19 KOs). Ruiz (39-4, 33 KOs) is far less proven against top opposition than Mares (31-3-1, 15 KOs), but he has a much better knockout ratio than the three-division champion who withdrew from the fight due to a serious eye injury. Regardless, Davis just hopes those criticizing him remember that when Vasiliy Lomachenko was a 130-pound champion. The current WBA 135-pound title-holder’s most noteworthy win came against a 122-pounder, Guillermo Rigondeaux. Lomachenko stopped Rigondeaux following six one-sided rounds in December 2017 in The Theater at Madison Square Garden. In his previous fight, Ukraine’s Lomachenko (12-1, 9 KOs) stopped another featherweight who had moved up, Miguel Marriaga, after the seventh round in August 2017. Davis realizes many boxing fans from Southern California were looking forward to him meeting Mares, a 2004 Mexican Olympian who’s popular in that region. Mares, 33, can’t face Davis because he sustained a career-threatening detached retina in his right eye in a sparring session late last month. Ruiz is a lower-profile opponent than Mares, but he, too, is a native Mexican who resides in nearby Glendora, California. “I just want to say I’m excited for February 9,” Davis said. “I’m looking forward to my new opponent. Sorry to the fans who purchased tickets thinking that I was fighting Abner. My main focus was fighting Abner. Davis-Ruiz will headline a “Showtime Championship Boxing” tripleheader Saturday night from Dignity Health Sports Park, formerly known as StubHub Center. In the opener of this three-bout broadcast (10 p.m. ET/7 p.m. PT), lightweights Sharif Bogere (32-1, 20 KOs) and Javier Fortuna (33-2-1, 23 KOs, 2 NC) will square off in a 10-rounder. The co-featured fight will match junior welterweight contender Mario Barrios (22-0, 14 KOs) against Richard Zamora (19-2, 12 KOs) in another 10-round bout.